Shower gels are not just my everyday shower essential for me. It is something that can cheer up my mood and freshen up the body. I love trying out different shower gels as I don’t like to stick to one particular shower wash for long. Recently I am experimenting with two new launch body washes from Fiama. I have tried quite a few body washes that are gel based. Such body washes were either too slimy or lacked in the fragrance part. The Fiama Ashwagandha Body Wash is new Gel + Crème formula instead of the old scrub gel composition. Thinking about trying this new body wash? Read on for more details, price and my experience! Packaging- This body wash comes in a transparent plastic bottle. The flip-top cap shuts tightly and the bottle dispenses the desired amount of product as I squeeze. The packaging is sturdy and spillage-safe. It has been color-coded in pink and coral. The ingredient list is mentioned in detail. Overall, it is a user-friendly body wash packaging. Colour & Texture- This shower wash looks translucent coral with pearly texture. The consistency is medium. It is more of a gel wash with the slight creamy finish. It creates enough creamy froth to cleanse the skin. The amount of lather is not too much like a shampoo but certainly good for a body wash. It does moisturize the skin. I have normal body skin in summer. It does not give stretchy feel even if I am skipping the moisturizer afterward. Fragrance- This shower gel has a floral fragrance to it with a hint of rich musky tone. The musk fragrance is not my particular favorite but those who love it will enjoy the fragrance. The smell, though reduced, stays 20-30 minutes after if I am not using a fragrant body lotion. Experience- This is a good body cleanser. It cleanses the skin from bad odor, sweat, and other impurities. Its gentle formula does not rip off the moisture balance of the skin. This body wash smells good and the smell has better-staying power than many other bodies washes from the same price range. It gives a fresh and clean feel to the body. 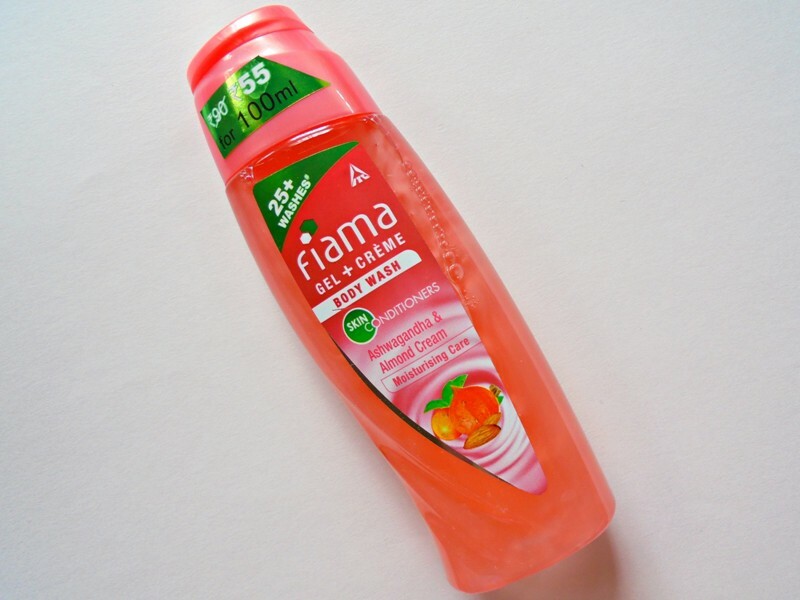 Some Fiama body washes have tiny scrubbing granules but this one does not have any. I am actually happy for that! Those scrub particles were too gentle to exfoliate the body skin and washing off those particles from the skin was a task in itself. This wash is much better than Fiama’s previous body washes. The consistency and formula of it are comparable to my two favorite body washes Palmolive’s Feel Good and Feel Glamorous. Fiama Gel + Crème Body Wash Ashwagandha & Almond Cream is a nice body wash for skin cleansing and removing the sweaty odor from the body. This body wash has gentle non-drying formula so I can suggest it to everyone. If you love musk fragrance then it’s a must-try! Goddess Braids Hairstyles You Will LOVE ! Eflornithine Eflora Cream Review – Does it Really Reduce Facial Hair Growth ? Also this one has all the things I want in a shower gel! If you love musky smell then you would love this.. This one is actually available in two sizes. The one I am showing is the smaller size. The bigger bottle costs 190 I think.